She came from an entertainment family. Signed to the record label of her uncle, Michael Jackson, her plan was to be a millionaire by the time she was age 19. But for all the resources she had available to her, she and her family did not know what to do or where to go when the police found her in the throes of psychosis on the streets of Los Angeles. 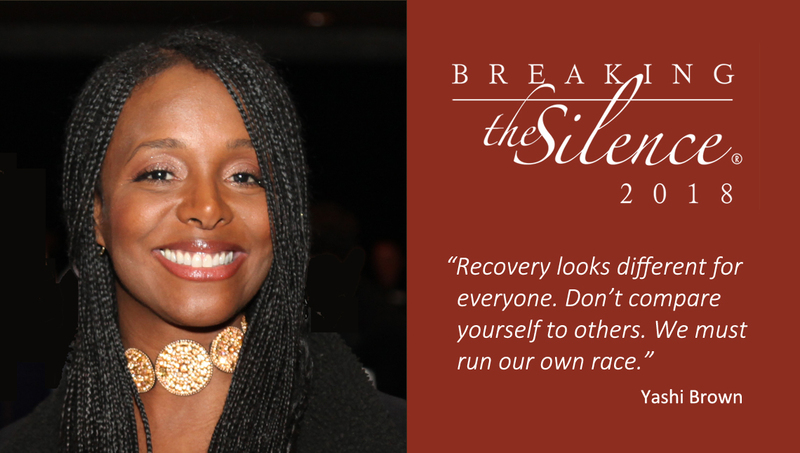 Mental illness hurts, said Yashi Brown, guest speaker at the 2018 Breaking the Silence program held on October 11, 2018. But so does the stigma that comes with it, she explained to the nearly 600 guests attending the evening program at the Holland Performing Arts Center and to an estimated 250 clients and staff at Community Alliance earlier in the day. That is why it is so important for those who have experienced mental illness, and those impacted by these illnesses to break their own silence and speak out against the misconceptions and stereotypes. Yashi shared her story of undiagnosed and untreated bipolar disorder, finding the right treatment, and a pathway to recovery that, with the support of family and friends, has led her to be the first in the famed musical Jackson family to go to college. It takes courage to heal, Yashi said as she urged others who live with mental illness to find their own, unique path toward recovery. Now a NAMI ambassador and national advocate, Yashi spoke passionately about the need for a full range of services and the community’s support. Our thanks to all the Sponsors and Supporters who helped to bring Yashi Brown’s message of hope and recovery to those served by Community Alliance and to our community.